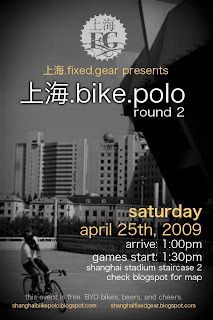 shanghai bike polo: mark your calendars : round 2 is here !! that's right! after a GREAT success last weekend we are proud to announce round 2 of shanghai bike polo !! afterwards for those interested we will attempt to arrange a gathering for some cheap drinks and food. this time we plan on having some music via ed's battery operated stereo - so get PUMPED. let's do this !! see you all saturday ! !